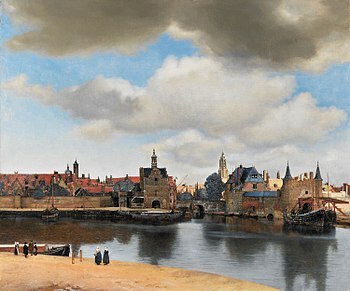 While Johannes Vermeer (1632-1675) specialized in "domestic interior scenes of middle class life", the Girl with the Pearl Earring being an excellent example, Delft was Vermeer's hometown and View of Delft is one of three known paintings in which the city is featured. His painting technique is said to be meticulous including the use of grains of sand mixed with some of his paints to provide additional texture. Using a limited choice of pigments and pointillism he created "probably the most memorable cityscape in western art". It's also fascinating to delve into Vermeer's possible use of mechanical aids like the camera obscura. Check out David Hockney's Secret Knowledge: Rediscovering the Lost Techniques of the Old Masters or Tim Jenison's Tim's Vermeer for theories of how Vermeer managed to "mechanize" his technique, allowing him to produce photorealistic detail without the benefit of any formal training.